The Mayne Island/Mount Parke site services most of the Southern Gulf Islands with digital PCS. 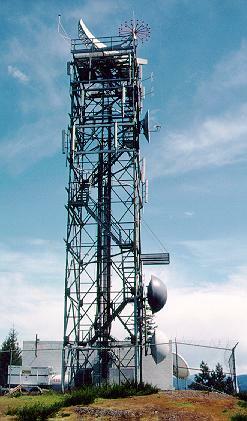 The Coast Guard main tower (shown here) contains a radar at the top and then in descending order Telus Mike, Telus PCS (just above microwave dish), and Microcell (just below microwave dish). Telus also has their own transmission compound with a monopole about 20 m north of this site holding 800 MHz cells. All cells are specifically aligned to serve ferry traffic; residents of Mayne and other islands may not be able to use this tower due to shadow effects and coverage areas. 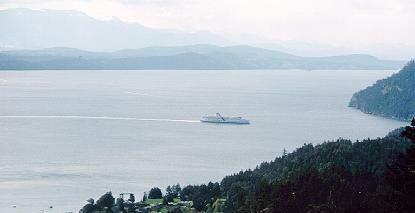 The Pender Island site services most of the Southern Gulf Islands with Rogers' coverage. The Telus Mike tower is configured for two different area codes. The cells that point south and west (channels 447-9 and 435-2) allow you to access the local Victoria area. The cell that points north and east (channel 419-8) allows local access to the Vancouver calling area. Put your Mike phone into test mode to access channel information. Mike users should watch for their phones roaming on Nextel near the US border. Long distance calls on Nextel do not require a 1 prefix and users may incur extra long distance charges on their bill.